‘Institutional critique’ is best known through the critical practice that developed in the late 1960s and early 1970s by artists who presented radical challenges to the museum and gallery system. Since then it has been pushed in new directions by new generations of artists registering and responding to the global transformations of contemporary life. The essays collected in this volume explore this legacy and develop the models of institutional critique in ways that go well beyond the field of art. Interrogating the shifting relations between ‘institutions’ and ‘critique’, the contributors to this volume analyze the past and present of institutional critique and propose lines of future development. 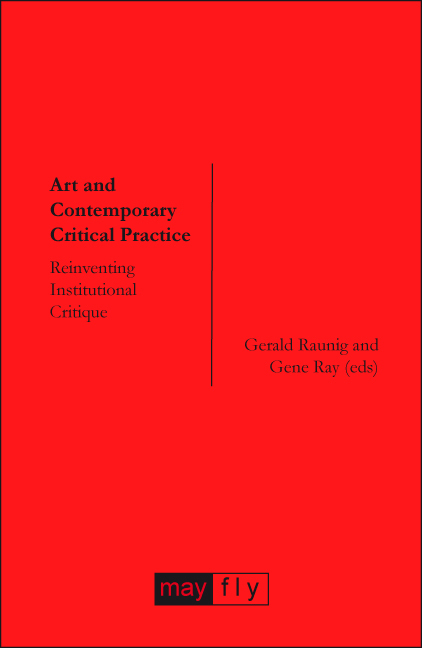 Engaging with the work of philosophers and political theorists such as Michel Foucault, Judith Butler, Gilles Deleuze, Antonio Negri, Paolo Virno and others, these essays reflect on the mutual enrichments between critical art practices and social movements and elaborate the conditions for politicized critical practice in the twenty-first century.